The average cost of installing slate countertops depends on whether you’re buying slab or tiles. After installation, slabs cost around $77 to $100 per square foot. Tiles cost around $50 to $65 per square foot. For the average kitchen counter space (a 20-square-foot area) expect to pay between $1,500- $2,200 for slab style or $1,000-$1,300 to install slate tiles. The average bathroom countertop is around 10 square feet, which means a slab bathroom countertop would cost between $800-$1,000. Installing tiles would cost around $500-$650. 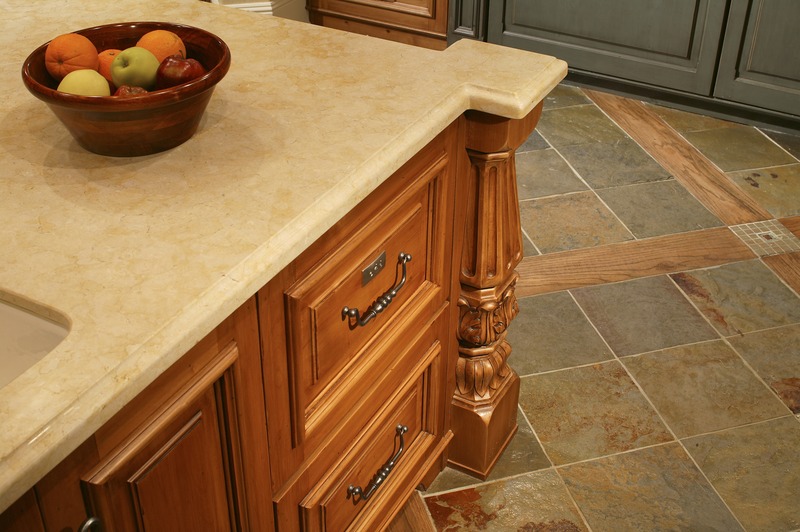 Whenever natural stone surfaces come to mind, people often think of granite or marble. These materials are great for kitchen installations since they’re beautiful, tough, and unique. 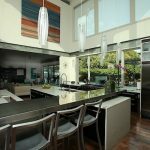 However, to save a bit of money and to make your space even more distinctive, you may want to explore slate countertops. Slate is a metamorphic rock constructed from clay and silt sediment compacted over millions of years. The heat and compression applied during its creation form new minerals like mica and quartz. Due to this intense process, slate has become a tough material that can be used in several areas in the home. Budget between $50 – $100 per square foot to install a slab or tile slate countertop. Most come in a simple black or gray matte, which has a serenely uniform look. However, it can also come in an array of exciting colors and finishes. This stone can come in green, brown, blue, red, purple, and mixed hues of brown and yellow. The costs per color can vary depending on the manufacturer, grade, texture and type (tiles vs. slabs). Consult with a pro or countertop manufacturer for the most current and accurate stone prices in your area. Just as its name suggests, this variation is black like a traditional chalkboard. It can match many styles of cabinets and flooring. Stains and fingerprints will look more obvious on this color. Black slate that’s left untreated can be used as a chalkboard. Leftover slab pieces may be something fun to add to your kitchen wall. This countertop typically comes as a dark gray with marbled effects on its surface. It’s one of the most common types of slate sold, which attributes to its affordability. One caveat is that imperfections are more noticeable on its dark surface. These high-quality stones come in rare colors that are highly valued. Slate harvested in Vermont come in beautiful shades of green, purple, and red. Vermont stone is strong enough to even be used outside, like on roofs. The textures are rich, and this material has a high performance in terms of durability, maintenance, and longevity in beauty. Consult our Slate Roof Cost Guide for detailed prices and installation factors. Predominantly white with some specks of marbled gray, white slate matches countless design concepts because of its neutrality. However, like black slate, stains and crumbs are more noticeable on its surface. Basalt is a complex blend of blue and gray. This countertop can be sanded down to have smooth corners and elegantly a uniform surface or be left in its naturally cleft texture. 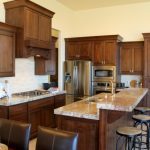 Its unique color can be tough to match with other styles of cabinetry, but it typically looks well with wooden or white cabinetry. Blue countertops are lighter than Basalt and come in a variety of blue hues. The colors are fun and open up plenty of creative designs for your home. Nevertheless, it can be a bit challenging to integrate blue slate into your kitchen or bathroom. Like Basalt, blue countertops go with wood and white cabinetry well. African slate is an exotically patterned and textured stone that is mixed with splotches of gray & brown. It can deftly conceal imperfections and scratches since it doesn’t look uniform. This exotic stone is going to cost more than domestically harvested stone, but it’s worth the cost. Looks great as a textured or smooth. Rustic stone looks like African slate but with an additional touch of green. Like African slate, it can conceal imperfections and scratches, making it less imperative to refinish or repair your countertops. Recycled glass can look like any type of slate you want with some additional perks like surprise pop colors that don’t occur in the natural. It’s good for the environment since it’s made of post-consumer materials. 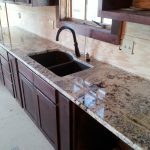 There are two things to consider before buying a recycled countertop. First, glass surfaces can get scratched easily. Secondly, people should not use it as a cutting board because it will dull out blades. Laminate is an affordable slate alternative that can be manufactured to resemble any kind of stone. Its low price point is certainly attractive, but it’s also not resistant to heat and impacts as slate. However, like laminate floors, its wear layer is resistant to scratches. Need to find a pro for your slate countertops? Slate can come in an array of textures ranging from a satin sheen to a rough and rustic natural surface. As you shop around, it’s a good idea to bring a design sample with you so professionals can help you select a model that’ll work best for you. Costs will also depend on the type of finish and texture of stone you choose. Stones left in their natural texture cost less than those that have been sanded to be completely uniform and smooth. Cleft ($): Also called “natural” or “textured”. The surface is rough since it keeps the stone’s natural texture, which hides imperfections well. There is less of a need to keep up with any scratches or dents because the surface is naturally non-uniform or level. The drawback is that dirt can get caught in some of the ridges, which makes it harder to clean than other textures. Cascade ($$): A relatively flat and uniformly finished surface that’s the perfect texture between cleft and honed. Homeowners who prefer to not keep up with a 100% smooth countertop but don’t want the natural ridges of a cleft texture will appreciate a cascade surface. Honed ($$$): All rough edges and surfaces are ground until uniformly smooth. As a result, it becomes a matte surface that can be finished with a variety of sealants to keep it matte or make it glossy. The sealant protects the countertop from stains and dirt. Honed countertops are easy to clean and maintain, but one must be vigilant to treat scratches and dents periodically as they’re more obvious on this surface. The type and quality of material you use. The manpower you’ll need to transport the materials. Slab requires more labor to transport since it’s very heavy. Tiles are much easier and cheaper to transport since they come in segments. The hours of labor required. Multiple workers are necessary for precision placement. Less workers needed for placing tiles, but more time required for placement and application of grout. DIY or using professional contractors. These days you can find them both online or in a typical hardware store like Home Depot or Lowe’s. You’ll also find more specialized selections at kitchen and bathroom remodeling stores both in town and online. There will be plenty of competition for your patronage, so be sure to shop around for the best deals. You can also find a hired pro who can often get great deals when purchasing materials for you. Surprisingly, doing the job yourself costs almost as much as hiring a professional! This is due to the high cost of specialized tools and materials you’ll need to get the job done safely and well. One of the most common safety concerns when doing this project is in handling the material itself. Stone slabs can weigh as much as 200 pounds each and can fall or break in transit. You can also drop them during the project, which can cause injury. Cutting the stone with a diamond blade also has its risks if you don’t know how to use the tools properly or don’t wear the right bodily protection. 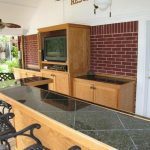 Installing a slate countertop is safer and easier when you hire a stone fabricator pro. Not only will all the materials be transported safely, but you’ll have plenty of help to install everything correctly and safely. The average cost to install a high-quality slate countertop falls between $75-$100 per square foot. Therefore, to install a 30-square foot countertop, you’ll pay around $2,300- $3,000 for the labor and materials. This is equal to or beats buying the materials and tools needed to do the job yourself, AND it’s safer. To get a good contractor, seek expert recommendations and check out online reviews. Also, make sure the contractors in question are licensed, bonded, and insured. You may be wondering how slate compares to granite and marble. Here are their chief attributes. Granite makes a bold statement, but it also has a bold price tag. Here are the prices before figuring the cost of labor and installation (an additional $25-$35 per hour). Granite countertops are priced between $50-$60 per square foot. Marble countertops cost between $40-$100 per square foot. Slate comes out to an average of $25 per square foot. Slate countertops are like granite’s obscure cousin. They’re both naturally constructed, are shaped from giant stone slabs, and are elegant additions to any home. Plus, they’re both hard and heat-resistant, which makes them great in kitchens. They are durable, won’t dent, and can hold hot pans without sustaining damage. However, there are some differences. 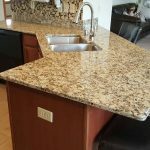 Granite is porous and will absorb stains, water, chemicals, and food substances into its surface unless annually sealed. Slate counters are naturally stain-resistant. Also, they’re completely non-porous, which makes them exceptionally anti-bacterial and mold-resistant. This means that slate doesn’t absorb acids, fat, or chemicals. Natural stones are unique. No slab or tile looks exactly like another. Use this aesthetic to complement your interior and create a unique space you can be proud of. Marble and granite both come with strong striations and veining, which makes them irreplaceable and extremely unique. However, when you cut into the slab, you never know what you’re going to get. Sometimes what you find won’t match your kitchen décor. Slate counters have a more uniform look. Though they’re still naturally one-of-a-kind and come in all sorts of designs, their patterns are subtler and restrained, making them distinct yet subdued. 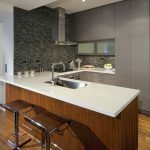 Many synthetic products (Formica, engineered stone, Silestone) attempt to imitate the look of slate surfaces because of their delicate boldness. Uniformity is what makes it so popular: it can fit any style (modern or traditional) and it can be used in any part of a room (flooring, backsplash, bar tops). In fact, since it’s non-porous, it’s a great material for wall paneling (especially in bathrooms and shower stalls) or even sinks (farmhouse sinks have become a very trendy slate installation). 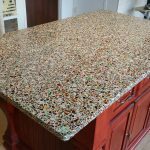 What are the benefits and pitfalls of using this material for kitchen counters, work tables, and other areas of the home? Durability: It’s highly resistant to heat, stains, and acid damage, making it great for kitchens and bathrooms, where things get messy. Moisture Resistance: It isn’t porous so it’s good at resisting moisture, stains, water damage, and bacteria. ROI: It’s a less expensive stone but still costs more than synthetic or lesser stones. As a result, it can add to your home’s value if you’re upgrading from a countertop of lesser value. 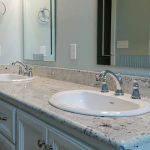 Pros: Having a slate bathroom vanity top means that you’ll have a durable countertop that’s easy to clean and resistant to damage. You won’t have to worry about your curling iron warping or burning its surface the way you would with a Formica or laminate countertop. 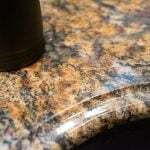 Cons: Homeowners will have to regularly maintain a natural stone countertop to keep it looking and functioning well. Though slate is strong and durable, all-natural stone products need help from time to time. Follow these maintenance tips to keep up a beautiful countertop. You should also check out our cost guide to repair countertops for more information. Polish it occasionally with mineral oil to reduce the appearance of scratches. Most scratches can be removed with a damp cloth, but deep scrapes may need to be buffed with steel wool. Cut grease easily with diluted dishwashing soap or a special stone countertop cleaner. You should periodically reseal your countertops. Whenever water doesn’t bead up on the surface anymore, that’s when resealing is in order. If any major repairs or restorations are needed, it’s always a good idea to consult the professionals who installed the product before doing it yourself. What info do you need to provide a quotation.